These are sort of Christmas-y nails, but it's still winter, so these are still in season! 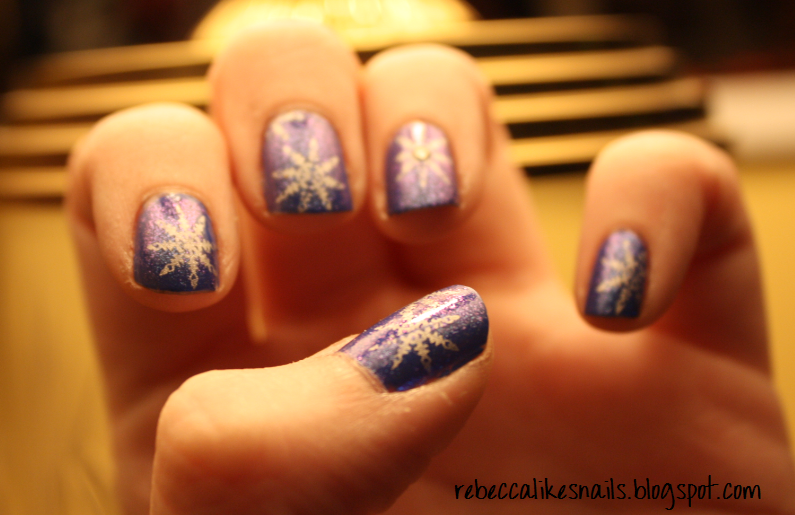 I didn't do many nails for the holiday season, but these were really pretty and I got a lot of compliments on them, both times I wore them. The first time I did them, I used Color Club - Pucci-licious from the Poptastic collection, however this picture is not color accurate. I took it without flash because the flash drowned out the rhinestone and stamping. I stamped with Sally Hansen Xtreme Wear - White Out! The rhinestones I added were from a wheel of 1500 that I got on ebay for $1.50. If you want rhinestones - ebaaaaay. And here is the second version! This is Sally Hansen Xtreme Wear - Pacific Blue with one coat of Sally Hansen HD in DVD. This picture is at a weird angle to show the duochromey goodness of DVD. 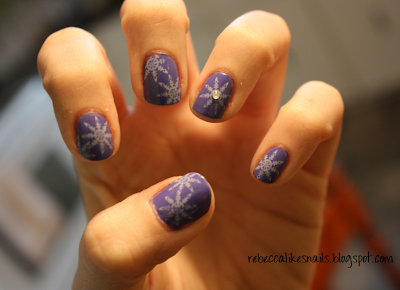 When I did these, I had just gotten China Glaze - Millennium for Christmas so I used that for the stamping, and again the rhinestones are from ebay. The snowflake image is from Bundle Monster, plate BM14. i like the top one a little better, may just be the picture but it seems a little less shiney. it makes it easy but it also makes it sort of hard, people never know what i have already!! haha.